As MSDN evolves, information in the function-oriented pages regarding unsupported operating systems is stripped out so the pages stay focused on what is relevant. The side effect of this culling is that the real lineage of these functions and what each OS supports is lost to the mists of time. Well it was, until now. Those who care about such minutiae can now forgive MSDN for their deletion and with a bit of SQL get the data they need. Yep, every OS module from 95 onwards has had it’s imports, exports, and selected PE header info extracted and committed to a handy-dandy Access database. 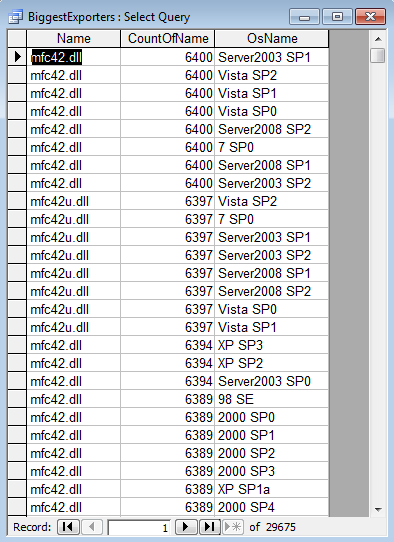 That’s a chronicle of 42 OS versions, 48,000+ modules, 2,100,000+ exports and 5,125,000+ imports. Apart from curiosity, the data can be used to generate statistics like I did with the previous version of the database. Definitive changesets between Windows versions can be produced, developers can verify the existance of an API and the stability of ordinals, and others can find the names of ordinal only exports and which parts of Windows call others. OK, so those aren’t exactly humanity enriching applications but it gets some usage from me, so it’s probably useful to someome else too (For example, Here’s a case where the FindExportsInCriteria query was useful). 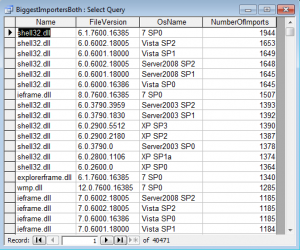 Some screenshots of the tables and some queries are shown below. As well as the database, the downloadable includes C# / C++/CLI source of the program that inserts into the database and produces XML “diffs” and a batch file to facilitate their production. 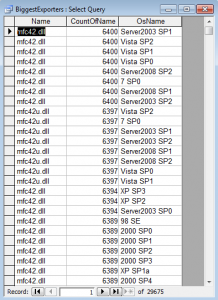 All the diffs the DB can generate are listed and viewable from here. 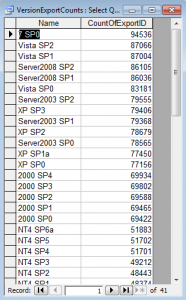 Note that the database compresses very well, decompressed it will take over 410 MB. Using the same files that the database is populated with, there’s a generated a list of resource counts per OS with module breakdowns here. 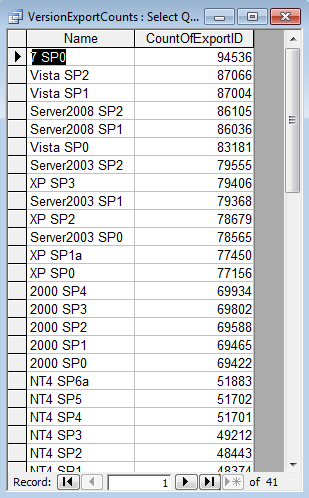 There’s also a collection of files containing registry stats per base OS installs here. If a service pack is missing, then I couldn’t find a download of it anywhere. On NT systems files from %windir%, %Windir%\system32, and %Windir%\system32\drivers were sampled. 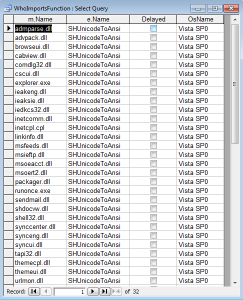 On 9x, files from %windir%, %Windir%\system, and %Windir%\system32\drivers were sampled. 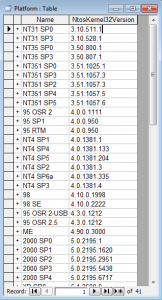 Except for 98 and 98 SE, all OS’s were installed on a default setup Oracle VirtualBox VM (3.2.8r64453) with sound, networking and USB enabled. 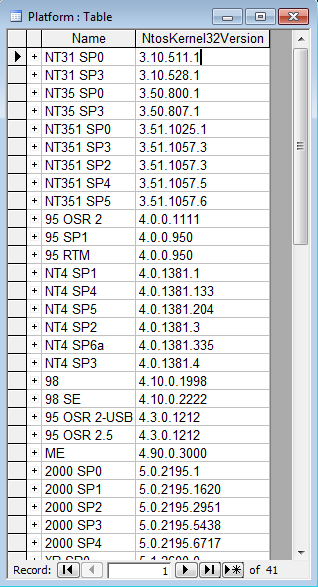 98 and 98 SE were installed on Sun VirtualBox 3.1.6r59338. When given options (NT4, ME and below) custom install was selected and everything checked on, also everything possible was installed on the network protocols and clients parts of setup. The exact service packs installed are listed here. System version numbers were extracted from the dwProductVersion(MS|LS) members of kernel32.dll or ntoskrnl.exe’s VS_FIXEDFILEINFO. Module version numbers (file and product) were extracted from the dwFileVersion(MS|LS) and dwProductVersion(MS|LS) members of their VS_FIXEDFILEINFO. 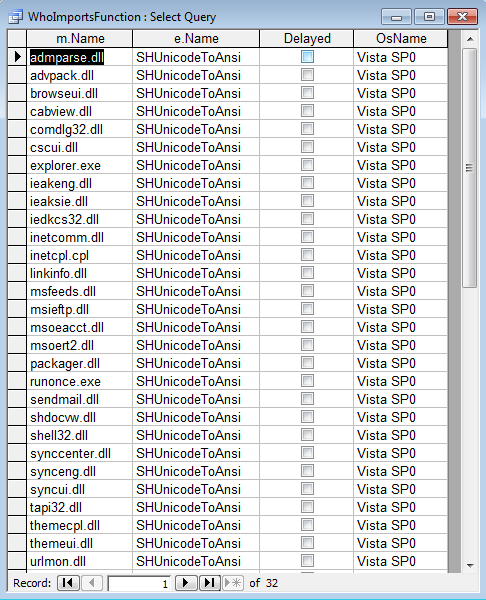 For ordinal only exports, the MS symbols were used to get the names. If no names were found, they are named as ‘Ordinal x’. This is mostly apparent with the mfc40 and mfc42 dlls. The database is in Access 2000 format, and weighs in at 385MB uncompressed. Starting from XP SP0, comctl32v5.dll is the version from system32 while comctl32.dll is the highest versioned comctl32 from the WinSxS directory. i cant believe to find this great source of undocumented winapi functions with their parameters, thank you so much to however helped you in documenting such thing.